The greatest drawback of Hellboy was its lack of focus. While the movie definitely did have a central plotline, regarding the end of the world as many of Hellboy's stories follow, it never felt as though this was the central focus of the movie. There were so many subplots and different unanswered questions that the movie couldn't focus in on one central theme, leaving the main story of the movie without any emotional stakes to actually glue the audience in. The movie kept changing its tone and theme throughout its two hour duration, constantly abandoning different stories and goals, only to replace them with new stories and goals that would also be abandoned 15 minutes later. Related: Can Hellboy Stop Shazam's Reign at the Box Office? Alas, the movie was not without some good qualities. Despite the story being an absolute mess, Hellboy was still fun at times. Much of the humor in the movie was dry and sarcastic, which was established in the very first line. David Harbour's performance kept this dry humor entertaining. Even when he was given the most cringe-worthy dialogue, Harbour miraculously found a way to play it off in a way that would at least earn a chuckle from the audience. At times, Hellboy also had some entertaining fight scenes. 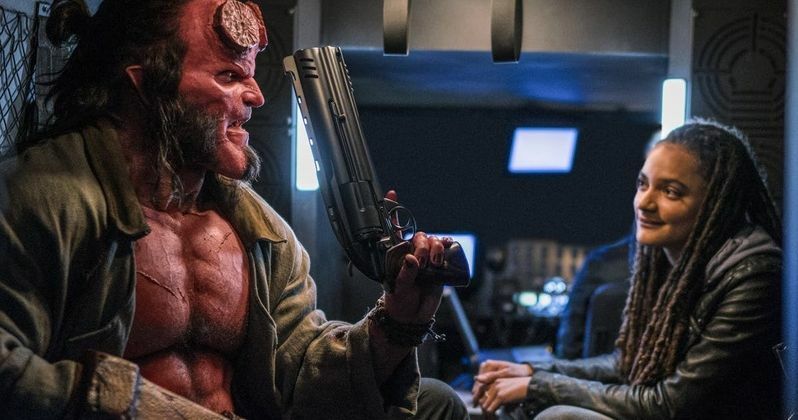 This combined with the humor made Hellboy feel almost like a demonic version of the Kingsman movies, which tonally actually fits the source material. Because of this, there's no doubt that some of Hellboy's comic-book fans will at least be partially pleased with this new take on the hero. The movie had a variety of moments with gore and theatrics that felt way too over-the-top, which may not have worked great on screen, but were at least there as an adequate homage to some of the comics. At the end of the day, Hellboy is just another one of those reboots that really won't go anywhere, but is at least partially enjoyable to watch. Though it represents a number of the issues currently present in Hollywood, both for excessive reboots and superhero movies, this latest reboot from Lionsgate is not without at least a couple redeeming qualities. It may not stand up well in theaters, but it will at least be an entertaining flick to passively watch at home once it hits DVD. At least then, you can fast forward through its extraneous "side-quests" that are really only there to add to the run time of this movie's minimal narrative.